A couple of weeks ago, after having listened to Stephanie Mach, I blogged that one of the key things that must be done to reposition how people living with disabilities are perceived, is to simply show their abilities. Today, in a session with Dale Larsen, I had the opportunity to watch a documentary called Right to Risk. (watch it below) The documentary covered a 14-day trip down the Colorado river (rapids and all) at the bottom of the majestic Grand Canyon in Arizona. What was special about this trip is that it was undertaken by a group of people living with Disabilities. This just reinforced in my head the notion that Disability is only measured by the task. As I was watching an idea formed in my head. What if across Africa – indeed across the world, a movement was formed called the Ability Movement? 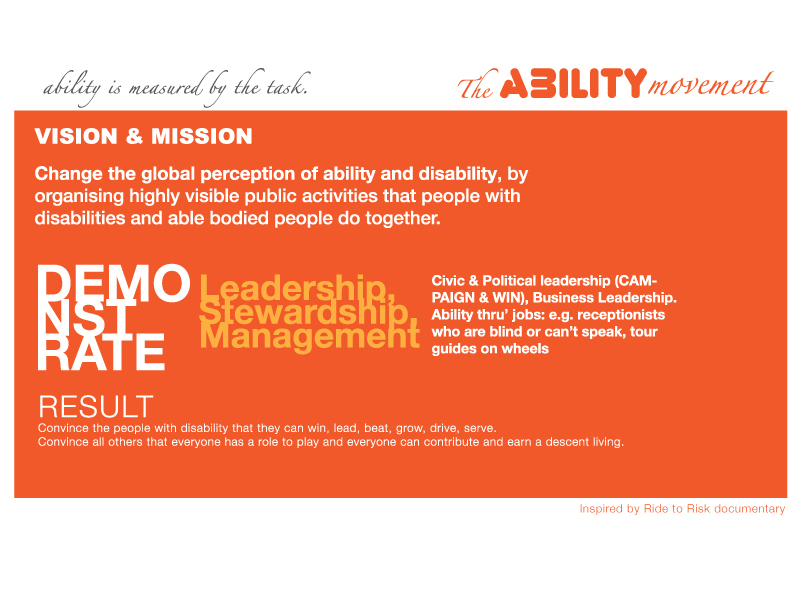 What if through that movement governments worked with a global network of people with disabilities, corporations and other non-state actors to publicly demonstrate the abilities of people with disability? As I thought of this, I doodled and this is what I came up with. I hope someone has the time, inclination and drive to take it up. I would completely support it.